Belgium - The Government of Belgium, represented by the Ministry of Development Cooperation, yesterday signed a framework agreement with IOM. From 2017 onward, the Belgian Government intends to provide multi-annual funding to IOM in order to assist in managing migration in a human and orderly manner and promote international cooperation on migration. This agreement seeks to support IOM in the realization of its mandate and to strengthen the priorities of the Belgian Ministry of Development Cooperation by undertaking efforts to contribute to better coherence between IOM’s activities and those of the Belgian Government. This will be partly done through greater exchange of best practices and strategic and technical knowledge relating to migration. IOM has a long history of cooperation with Belgium; the organization was created in Brussels in 1951 and Belgium is a founding Member State. Nearly 70 years later, the Belgian Government is highly engaged in the implementation of the 2030 Sustainable Development Agenda by supporting durable and inclusive economic growth, as well as, a human rights based approach. Through this agreement, the Belgian Government recognizes IOM as a multilateral partner in reaching the Sustainable Development Goals by emphasizing IOM’s role as the global lead agency on migration. “No State or organization can stand alone in today’s interconnected world. There is an urgent need for strengthened collective action, including global, regional and local solutions, to improve migration management,” remarked IOM’s Director General William Swing following the signing of the agreement. This agreement will allow IOM and Belgium to continue their strong partnership in responding to humanitarian crises, finding durable solutions to displacement, reducing risks and promoting resilience, including in protracted crises. 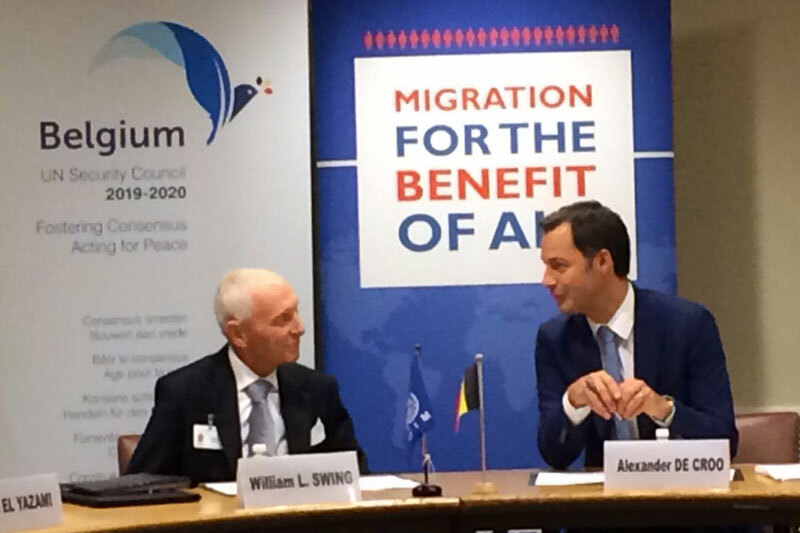 IOM and the Belgian Government will work together to address the negative impact of migration, through migration management capacity building of other States – guaranteeing respect of human rights and the well-being of migrants. The agreement also distinctly notes a partnership on research to better understand the complexity of migration. In practical terms, the objectives of the agreement will be achieved through better coordination, financial contributions and mobilization of capacity and expertise.